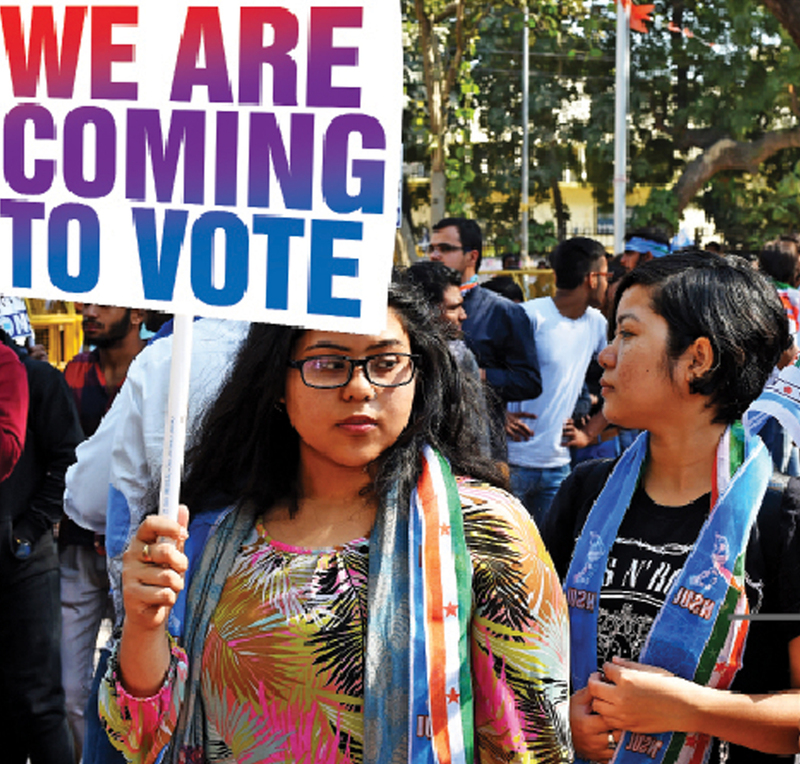 One and a half crore people – half the size of Australia’s total population – is the number of first-time voters registered for the 2019 Lok Sabha polls in India, as declared by the Election Commission. The number is a testament to the fact that young voters can hold the key to which party leads the nation for another five years. This fact is not lost on political parties and their leaders, as they try to reach out to the youth through speeches and social media posts. On a Friday afternoon, as much of Delhi University’s North Campus was celebrating Holi a week in advance, a very enthusiastic first-year political science student shared her thoughts on the upcoming elections. Firstly, Swati’s commitment to the electorate is exhibited by the fact that she would go home to Lucknow to vote “like a responsible person”. What does she feel about AAP’s demand for statehood? This Hindu College student does not quite see eye to eye with the Delhi government’s desire. She does not believe that the Capital should aspire for that status because it is, as she puts it, “a complex territory”. While it has had its administrative problems, admittedly, she doesn’t think statehood is the answer. BJP’s claim to be the sole upholder of national security does not make sense either. While she says that security is no doubt an important factor in the country, it is not a matter of contention, with the armed forces doing a good job. She feels, “Security is like a carrot – it’s a distraction from the main problems”, which Swati says, are problems like low employment. But even though the Congress promises the same, for her it still seems like any other promise that parties have to make, after all. “They need something to campaign for. They are focusing on jobs. Let’s just keep it at that,” she says with a laugh. Further on, at Kirori Mal College, Patriot spoke with two self-declared best friends Shiv and Anand. But both had contrasting views on politics, as you see most families in the current climate do, debating theories and allegations over prime-time news hour. Shiv thinks that the AAP is not capable of managing all institutions alone, if they were to get statehood for Delhi. Instead, he thinks the solution would be to “completely dissolve the Union Territory government” giving entire control to the Centre. On the other hand, his friend Ashish backs the Delhi statehood call “since it is the most important part of the country. While I agree with Shiv on the fact that the clashes should be avoided (between the LG and chief minister) for the betterment of Delhi, I feel it is only possible if AAP gains complete power over all institutions like the police”, he adds. Moving on to the calls for national security as a poll issue, Shiv agrees that while it is important, it should not be the sole contention for a party. What parties must focus on instead should be the security within the country, “most importantly the safety of women”. Ashish, on the other hand thinks, that the whole national security issue is being raised to increase the vote bank for the ruling party: “The over-publicity of the Balakot air strikes by the government is the biggest example of how they use this to manipulate people’s sentiments”. He says that there are lot of other issues to focus on rather than national security since the army is more than capable of handling it. Congress’ issue of more employment for the youth is something that both friends agree on. “If there is one thing that the current government has failed in, it is providing employment for the youth. 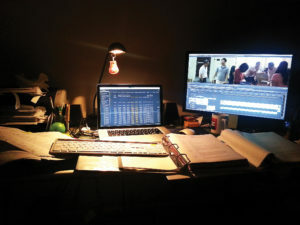 So many people have high degrees, but sit idle at home because there are no jobs. I am worried for my future also”, says Shiv. Ashish says that whoever comes to power should focus not only on increasing the job vacancies, but also invest in providing skills to the youth, so that they can be eligible for multiple jobs. Though these two best friends have contradictory views, both of them are excited to vote for the first time. “It is very thrilling to be a part in deciding the future of India for the next five years”, says Ashish. However, he adds that it is still a promise, and political parties tend to forget their promises once they are elected. As far as the issues of statehood and national security are concerned, Sonu feels that both issues are just propaganda tools for the parties, instruments for drawing in more votes. 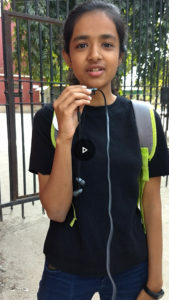 Anu, who is pursuing her Masters in English from Ambedkar University and is a first-time voter, very ardently expresses support for the idea of statehood. A student of economics from Indraprastha College for Women, Sneha’s mother is a teacher who is facing issues with the current schooling system in Delhi and thus her vote will be for whoever can resolve this. However, as we went around the campus, we found many students who were clueless about the statehood issue. They simply shrugged and added that they are aware of such a demand. While one student from Ramjas College stated that he is “a student of physics and so I don’t follow politics” the other one retorts: “If we have no idea about statehood, is it really that big a deal for AAP?” He looked very sure of himself. In fact, not everyone is excited about the elections. 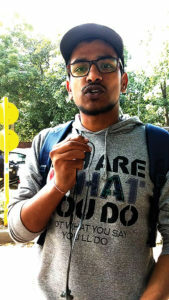 While Harsh from Ramjas College says that he won’t vote since all parties are equally bad, Raj from Ambedkar University says, ““I don’t really know much about elections. I always ask my father whom to vote for”. Not all students can be deemed as well-informed nor can they be considered ignorant. 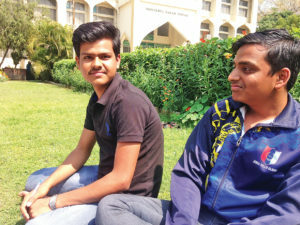 Patriot went to Jamia Milia Islamia, a prestigious university in Delhi, to meet students and find out how the poll promises of three political parties resonated with them. The first group we approached were sitting in the well-kept lawns, soaking up the March sun, studying and taking notes at 11 am on a Friday morning. Upon being presented with the promises made, we were met with confusion for the AAP’s poll issue. “Yeh statehood hota kya hain?” (what is this statehood), was the prompt answer given by Ashish Tiwari, a BA second year student. When explained that it would “end the autocracy of the Centre”, after a little thought, Tiwari gave a nonchalant response, saying if the AAP got its demand, it would be good. But whether or not he really understood the whole gamut of what lay in giving full statehood to the state government was not distinguishable. 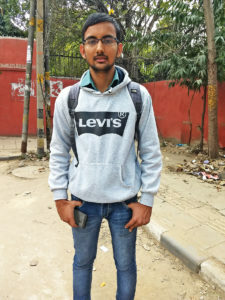 For this student who hails from Varanasi, from where he will cast his first ever vote, what matters most in Delhi is ending the practice of bribery. “It’s not the people at the top but at the bottom who take money to get work done. Firstly, end this corruption”, and then perhaps the country can talk about other issues, he says. 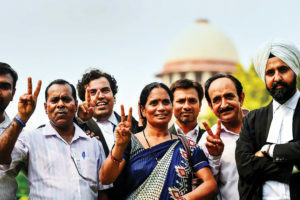 Tiwari, who moved to Delhi over two years ago, believes the other issue that no one is talking about is the high incidence of crime in the city. This comes from his own experience of having his iPhone stolen as a newcomer to the national capital. “Have you seen the number of cases of theft? And how many get solved? Hardly any! The police will catch these thieves and let them go the next day maybe after taking money from them”, a clearly agitated Tiwari says. While we reminded that the elections would be for the Lok Sabha and not assembly and one must also think in the national scheme of things, what promise resounded with him was the BJP invoking national security. After the Pulwama suicide attack – which was claimed by Jaish-e-Mohammed – saw 40 of CRPF men killed on February 19, and consequent action by the Indian Air Force at Balakot, Pakistan, the nation has been charged up with jingoistic rhetoric. And this rhetoric seems to have worked on quite a few individuals. One of them being Tiwari, who says that “now it’s our turn to hit them (Pakistan)”. Another reason why he believes in the current central government, is the Swachhta Abhiyan. In this they had promised to make India open defecation free. For this, in rural India, sanitation coverage stands at 93%, with over 8.4 crore toilets constructed till 2018. And while Tiwari says his home did not receive the benefit, and they had to build one themselves, his confidence still lies with the BJP. 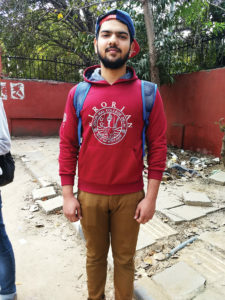 His classmate Puneet, a 20-year-old first-time voter from Sanjay Colony, Okhla, also believes the most important need of the hour is the “protection of the country” and this he feels can be ensured only by the BJP. But he backs this with misinformation about, JeM chief Masood Azhar, who he believes was released from jail by the Congress government. Even when informed that it happened during the government of Atal Bihari Vajpayee, he presents another point. He talks about the 2001 attack on Parliament and Mumbai terror attacks of 2008, where on both occasions the then PM “Manmohan Singh did nothing about it. What we need is a government that responds to such actions and this is happening now”, he adds. “When war happens then yes, society goes back a few steps because of all the destruction. But at least we will be able to destroy Pakistan”, he says. When reminded that even Indian territory would come to harm along with its people and its soldiers, he does not have a response. But Congress’ promise of jobs is something he does connect with. “We all will need jobs in some time” but he does not find believable the Congress’ promise to provide employment to the millions of jobseekers in the country and giving minimum income to the poor as achievable. “Congress always promises a lot during elections. This promise of giving minimum income they will not be able to achieve because there isn’t enough money,” says Puneet. And when it comes to AAP’s promise of statehood, it does not mean much to Puneet. He actually questions the capability of the state government to control the police in the Centre. While the party has provided water and electricity in his area where earlier they required “two tankers of water everyday”, there is, he says a desire for change in the people. In the canteen, where students relax between classes, we met three girls from the education department of Jamia Milia Islamia. Without much thought, they pointed to the need of having development in the country as the foremost poll issue that parties must promise. AAP’s statehood issue didn’t mean much to them. As the three sat around the canteen area eating patties and drinking Frooti, the conversation became a discussion on what is required in the city — not statehood but a focus on students and their needs. Farhat is the only one who applied for her voter ID card in November and hopes to receive it before the May 12 elections. 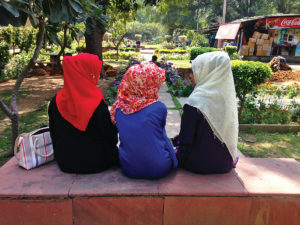 Her classmates Fauzia and Shazia have not done the needful, nor can they explain why. All three hail from Okhla and live with their parents. While their parents have their own thoughts on who to vote for, this does not influence them. For them, AAP will probably not make much impact because all that people will look at are the national parties of the BJP and the Congress. “This is the Lok Sabha elections, people will not look at what the party can deliver in their state but at the national scenario.” And then the inevitable will happen, Fauzia says, the vote will be divided. At the same time, they believe many people will still ally with the state government because of what they have done in education and healthcare. When asked about the BJP’s promise of national security, all three echoed that the problem didn’t lie in national security but just security of each individual even at city level. “You can’t walk around on the road”, without being afraid for your life, “you can be jacked. Anything can happen in Delhi. And not just to women. No one is safe here.” Thus, they point out, shouldn’t the complete security be an issue political parties must address? And then our conversation ends with a discussion on the lacklustre promises of all parties, which are not talking about development. 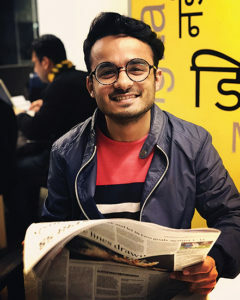 Gaurav Mehta, a 23-year-old content writer, states the issue that should be prioritised by any party in Delhi — pollution. He thinks the issue of severe pollution level comes before statehood — the issue currently being part of AAP’s narrative. “I will be voting for the first time now as I had not turned 18 when the last general elections happened. I will be looking at different parameters before I cast my vote”, says Mehta. Since childhood, he has been accompanying his parents to the voting booth, excitedly watching the voting process. He has a different perspective. “I am voting for the MP (not the party). And when I’m voting for the MP, I look at what all the MP can do for me. And how the action of that MP is going to affect me,” he asserts. He doesn’t care which party wins the Lok Sabha elections. The current MP is his first point of reference.